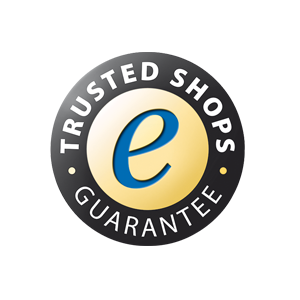 Roll-up.com guarantees the supply of high-quality roll up banners. We specialise in roll up banners and we only offer high quality and at a very competitive price. The whole process, from design to product, is carefully monitored. We want you, the customer, to be satisfied with the product you pay for. 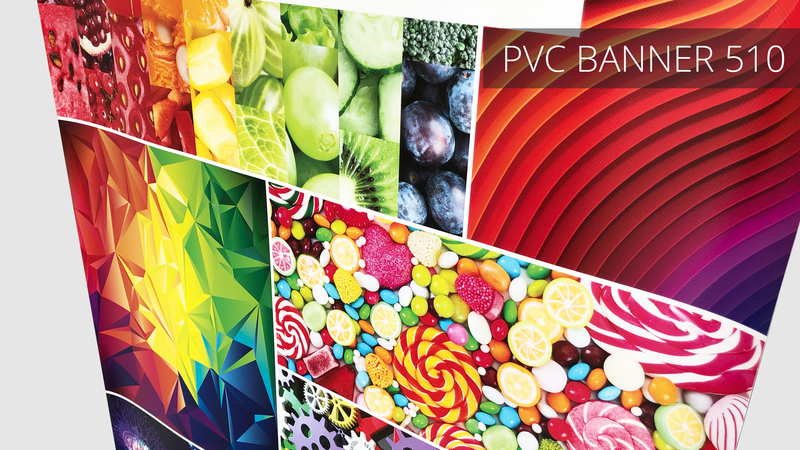 Because we produce roll up banners in-house, we can control the quality process from start to finish. There are a number of factors that are very important in order to deliver good quality as standard. Below you will find what these factors are. Warping: There is virtually no warping while the banner is tensioned in the cassette when using DUObanner. Use of traditional PVC banner 510 means the print warps considerably more. 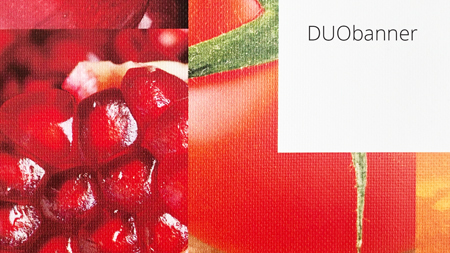 Quality of the print: DUObanner material has a smooth surface which means the print comes into sharper focus. PVC Banner 510 has a rougher surface which means the print isn't quite as sharp. 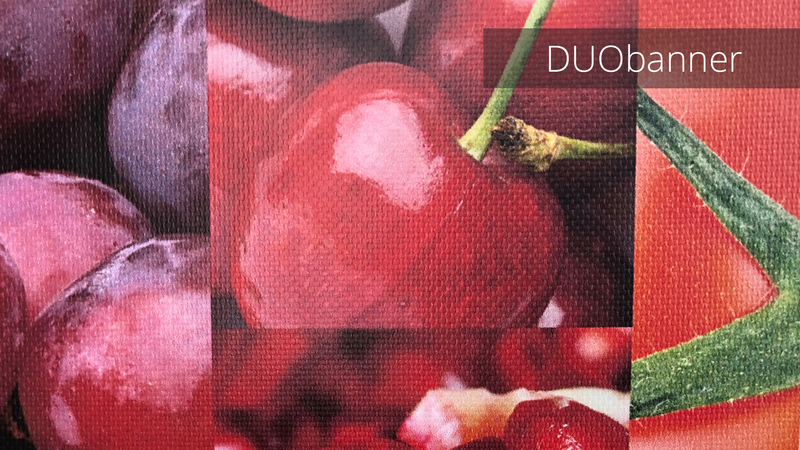 A print on DUObanner will always be of razor-sharp photo quality. 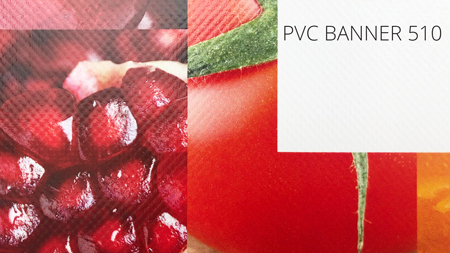 Surface sheen: Our DUObanner benefits from a matt surface. PVC Banner 510 usually has a surface sheen to it. A matt surface provides little reflection of light, making the print at a trade fair visible from all sides. Transparency: The DUObanner benefits from a 100% block-out layer. This means the banner does not let light through. Transparency can be a disadvantage when the banner is placed in front of lamps or windows. There are many roll up cassettes available on the European market. Many models look similar but appearances can be deceiving. For the cassettes, it is all about the weight of the casing and the quality of the winding mechanism used. By using less aluminium (thinner walls) as cassette can quickly become 10% cheaper. But this negatively affects the stability of the roll up banner. It is important that the stand is always securely placed at a constant angle. This is why roll-up.com only uses carefully assembled and reliable cassettes. The quality and price of a cassette are determined by the amount of aluminium (weight), design, winding mechanism, click frame, carry case and options (adjustable stand or feet). At Roll-up.com, you can find economical cassettes but also more expensive cassettes with a luxury look and replaceable prints. When your design or request is received by us, it is handled by one of our professional team. Your personal design is checked for manufacturability and quality. Should there be mistakes in the design (such as alignment), this will be communicated to you. If you don't have the proper software for designing the roll up, one of our specialists will be happy to do it for you for free. 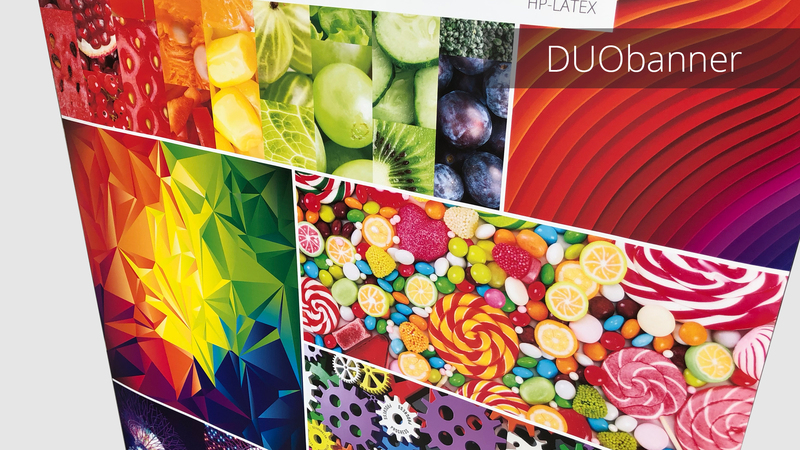 Our roll ups are printed digitally, which ensures razor-sharp, full-colour printing. After printing, the roll ups are assembled and securely fixed in the cassette. All products are printed and assembled at our company in the Netherlands. We always deliver a high-quality print. Speed is of the essence, but print quality is even more important. With a resolution of up to 1200x1200 dpi, we guarantee a high-quality print. Our prints are odourless and quick drying thanks to the newest print techniques in the field of printing. In addition, the printing techniques used are provided with various certifications for environmental friendliness and safe use (Indoor AgBB, Greenguard Gold and EN15102). After manufacture, the roll up banners are securely packed and shipped with reliable suppliers so that the package is delivered safely to the customer. Register and get the latest information about our products or services.